Unfortunately, we have seen all too often what Albert Einstein described here occurring in many businesses. In our experience, companies that address customer touch-points effectively have a much easier time building a sustainable competitive advantage, as well as brand equity. Consequently, these companies also generate more revenue and therefore margin dollars. As the ancient wisdom states “change and success come from within.” What this means is before companies can address customer touch-points, they must first perfect their business touch-points. 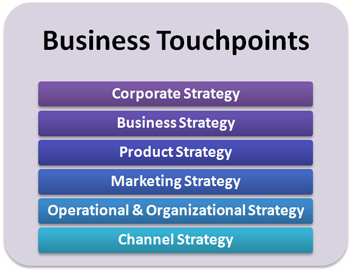 Business touch-points affect every aspect of the business as we explain below. Reinforce your foundation for a faster and sustainable growth. Build your brand equity while addressing customer touch-points. Increase your revenues and margins with operational excellence and go-to-market plans. There are situations when our clients want us to run their organization on a temporary basis.